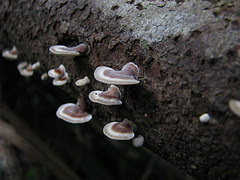 These wild mushrooms (or fungi) grows on the sides of dead wood. 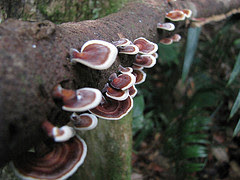 Not sure if this fungi are poisonous to people, but they are not eaten either. Their flesh is too tough and leathery. 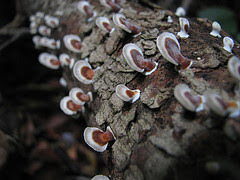 This fungus helps people by decomposing old trees so that nutrients can be recycled by new plants and animals. It also grow by itself or in small groups. Excellent use for screen wallpaper. Let me know if you want a bigger size. 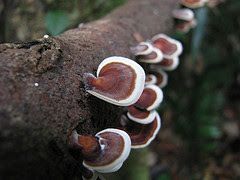 I am unable to identify this fungi but is very similar to "Turkey Tail" species (scientifically called "Trametes versicolor"). See www.fcps.edu/islandcreekes/ecology/organism_menu.htm for technical data. The picture was taken Sep 08, 2007 at Semengok Wildlife Center about 12 miles from Kuching, Sarawak.